Clay, the table-sculpture with a pure and refined elegance presented at the Salone 2015 and already a multi-award winner just a year from birth: Iconic Design Award 2015, Good Design Award 2016 and the Red Dot Award in the Product Design category 2016. Clay is presented now again to the public in the new oval version which differs from the original model in the elliptical shape of the top and base. Table with base in rigid polyurethane covered by hand spreading in the new finishes concrete grey luna and tufo stone. Tops in MDF (indoor) or toughened glass 8mm (outdoor) covered in the new finishes concrete grey luna or tufo stone. New oval Clay: 160x110, 180x120, 200x120, 220x120cm. Desalto has always been an integral part of the Brianza area manufacturing tradition, stretching from the 1950s to the present day. Brianza is a special region where the masters of Italian design found a fertile environment and resolute, enthusiastic business people. Desalto founders, the Orsenigo family, are among the entrepreneurs who helped to spread, worldwide, the concept of a product based on a constant technical and technological research, aesthetically sophisticated and designed to be functional. Over the years, a fruitful relationship between designer and producer nurtured a virtuous cycle, which led to a wide range of articles featuring an elegant design and high quality. Desalto meticulous quality control is applied throughout the manufacturing stages from the prototype development to the engineering and working in a dynamic partnership with the many well-known or young and up-and-coming Italian and international designers invited to share their creativity with the company: Marco Acerbis, Shin Azumi, Riccardo Blumer, Claudio Caramel, Caronni + Bonanomi, Piergiorgio Cazzaniga, Pierluigi Cerri, Decoma Design, Fattorini Rizzini & Partner, Gordon Guillaumier, Marc Krusin, Gianluigi Landoni, Arik Levy, Piero Lissoni, Nendo, Denis Santachiara, Stefan Schoening, Sigla, Jacob Springers, Studio Ausenda Greco, Andreas Weber, Hannes Wettstein e Tokujin Yoshioka. All different yet individually unique visions sharing Desalto’s own vision centred around expressive harmony and refinement, clean design, originality and high technical performance. 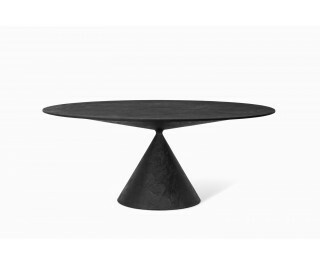 The result of this approach leads to the many products which have become internationally renowned bestsellers, such as Fan, Helsinki, 25, Liko and Mac table ranges; Sand and Kobe chairs; Every, Tender and Stilt extending tables; the Japanese designer Tokujin Yoshioka’s iconic, multi-award-winning Element table collection and then the most recent Clay table which has received massive appreciation from both public and press. Desalto has a broad, varied range of furniture – tables, chairs, stools, bookcases and accessories – and a creative and production-centric development, also focused on the contract market where quality, technical performances and custom-made solutions qualify the company to be active worldwide in different fields. Its internal flexible organisation ensures fast response management, lean design process and logistics, a must in this sector, in which Desalto play an important role providing different solutions: a standard collection of great versatility that surprises for the many possibilities of combinations and finishes; the option to alter the standard product range, to respond even more promptly to the needs of a specific project; the opportunity to develop customized solutions in terms of formal and material research, by granting the excellence of design that has always distinguished every creation of the brand. Desalto employs avant-garde technologies, such as its laser-cutting plant, welding, powder and liquid painting systems, and a sophisticated in-house galvanic plant, which enable a fully-monitored production cycle and the combination of different materials – such as metal, wood and plastics – by optimising their own intrinsic qualities. Desalto has always been focused on environmental sustainability: its galvanic plant includes an exemplary water cycle: the water is used, recycled and then ultimately purified in accordance with the strictest standards. A new photovoltaic system composed of 1730 solar panels has been operating since 2011. The generated energy covers the company needs, thus resulting in a virtuous cycle which positions Desalto among those companies which are the most proactively committed to sustainable practices. Its full commitment in many different fields places Desalto among the world leading companies in the high-end furnishing sector. Desalto currently exports 70% of its production, which is sold in Europe, Asia and the Americas through about 400 stores located in the most important cities.